Everything (about this card) is awesome! I made this for a very special four-year-old’s birthday party this weekend. Like it? Want to make one yourself? I created the SVG cut file for my Cricut SCAL. Feel free to email me at gspeegle@gmail.com for the free file (WordPress doesn’t let me attach SVG files), if you want to make a card for yourself as well. 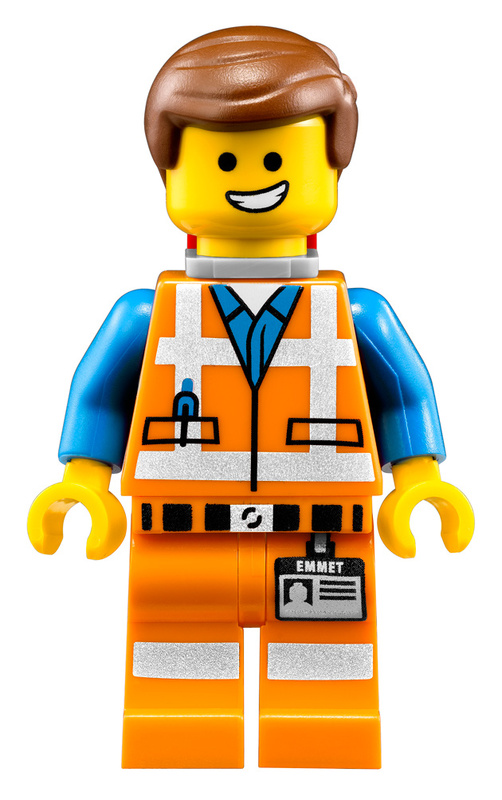 For Emmet’s outfit, I chalked the edges with light blue and then added some custom details with a Sharpie and strips of hand-cut gum wrapper. 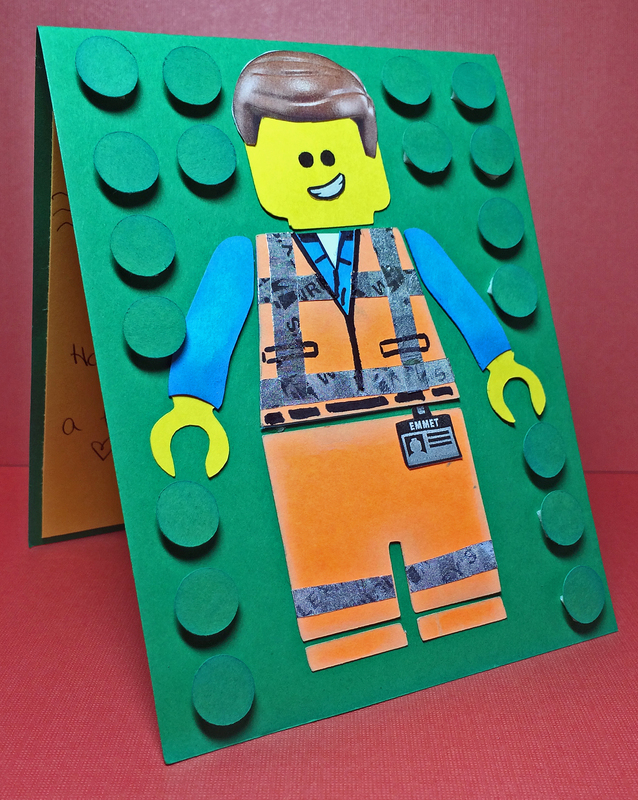 I printed out this image on the side here so that I could cut out the hair, smile and Emmet badge. I also cut out several .5 inch circles and inked them with green Color Box Cat’s Eye chalk ink, before affixing them to the background with foam pop dots. Everything is awesome when you’re no longer three. 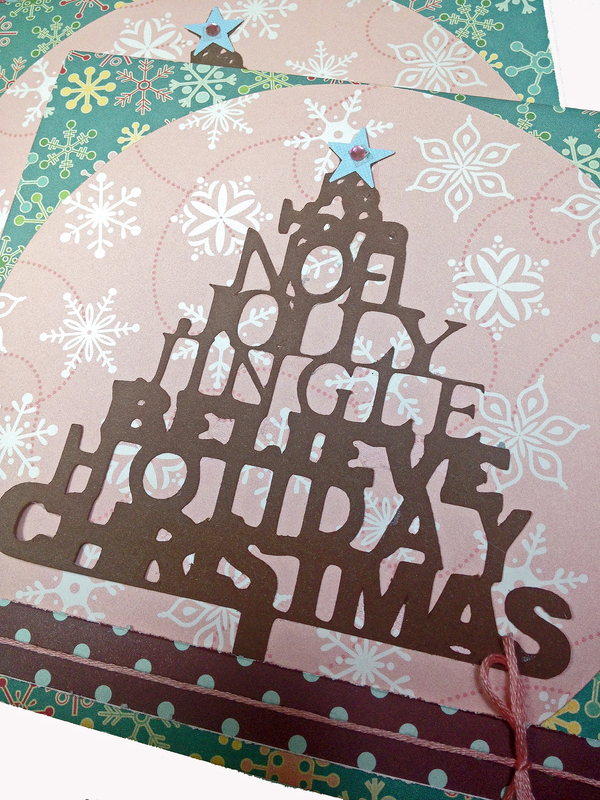 Free Handmade Holiday Cheer – Christmas Card Giveaway! Woo! Christmas! I love this season SO much that I’m doing my part to spread the joy by giving away this three-card collection! 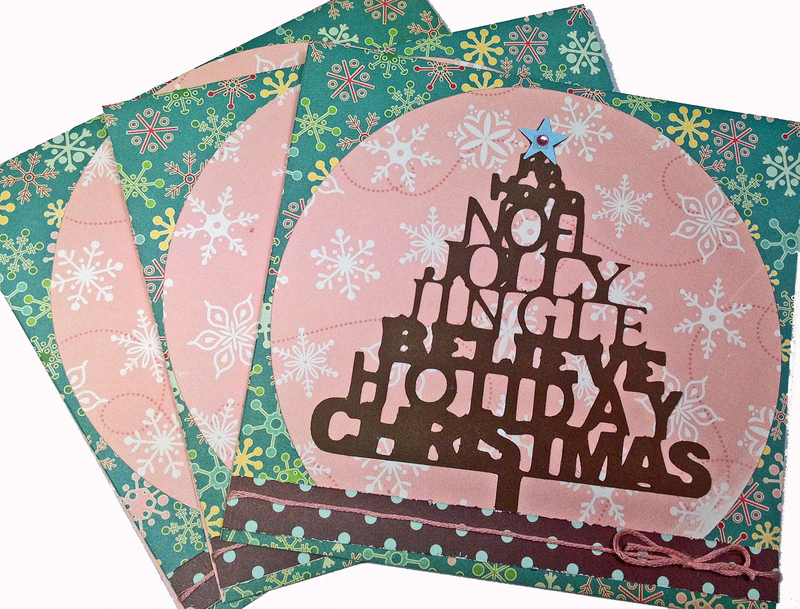 I have lovingly designed these one-of-a-kind creations with a large die-cut greeting embellishment – complete with hand-cut star and pink rhinestone. 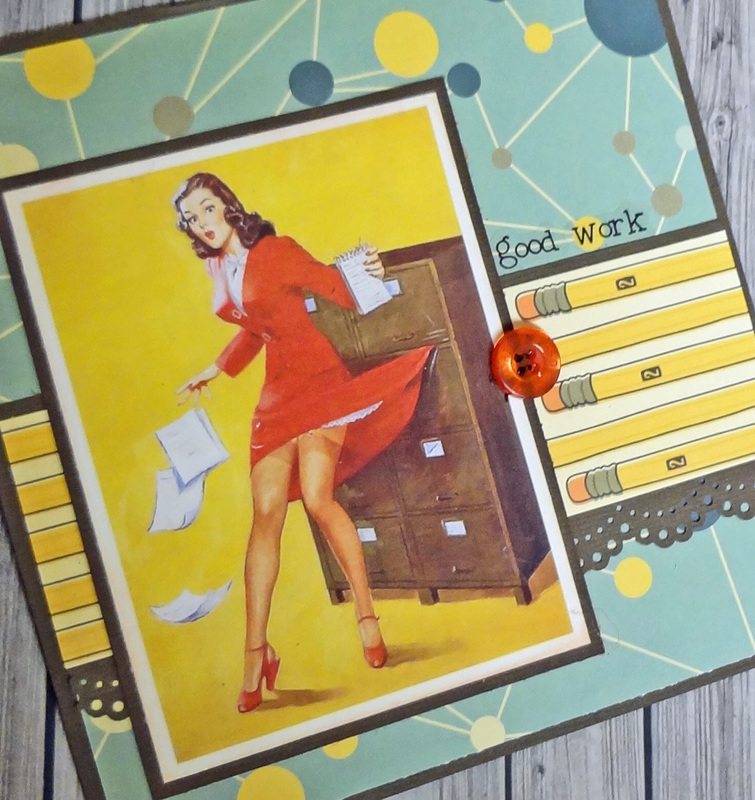 I have also added baker’s twine and festive polka dot cardstock along the bottom. 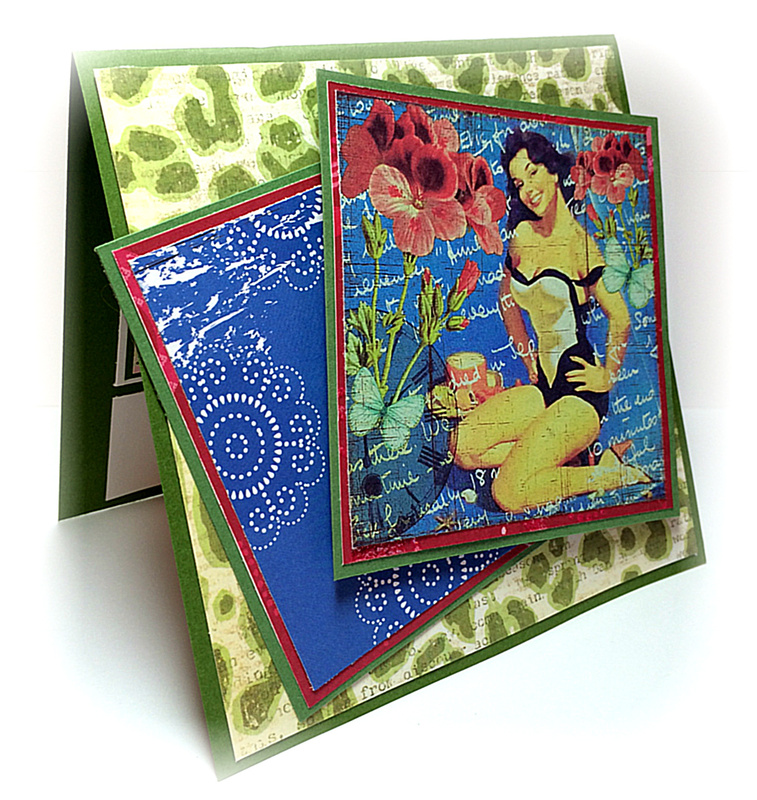 The inside is also fully embellished (just like a present!). 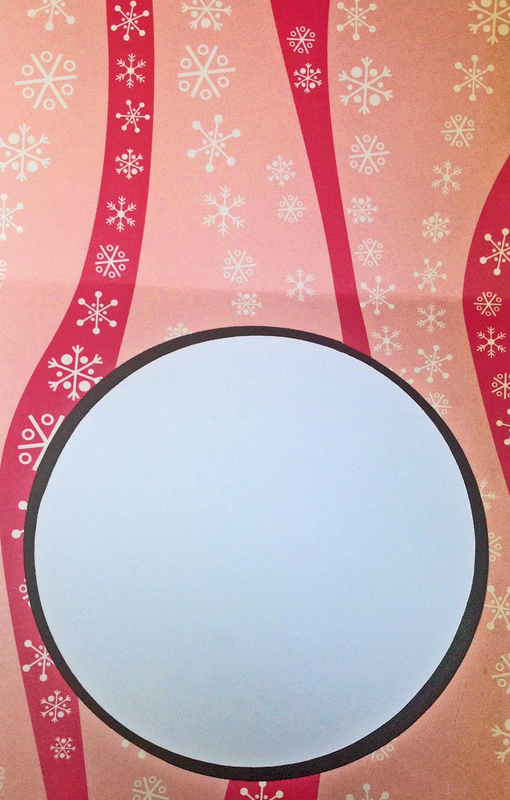 Each card is about 5.5 inches square and comes with a white envelope. * Leave a comment here telling me all about your favorite Christmas tradition (and please be sure to leave me your email address as well, so I can contact you when you win). * Share this contest link with your friends on Twitter or Facebook. I’ll announce the winner on Friday, so you’ll have these puppies in plenty of time to mail them to your closest loved ones. Thanks so much, and happy contesting! 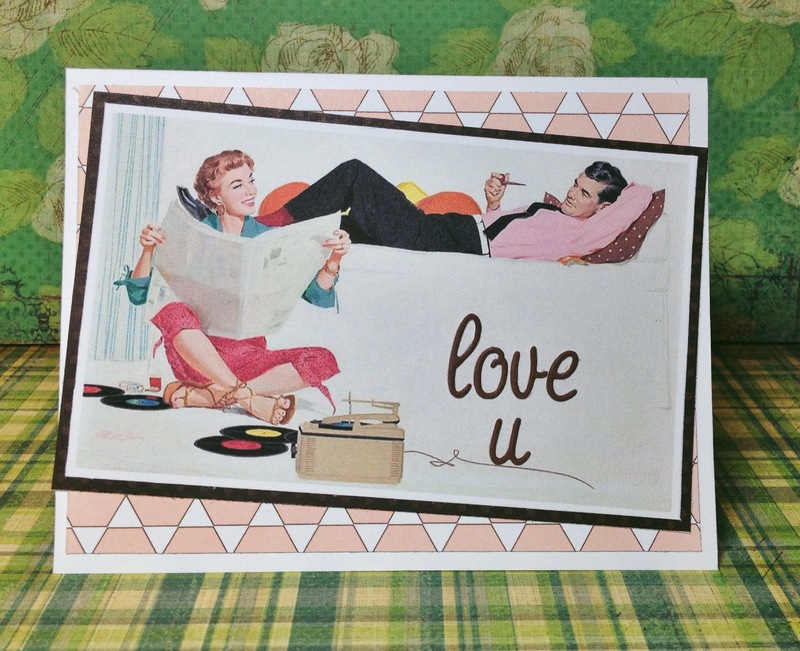 I love the kitsch of 1950’s retro. Just absolutely love it. 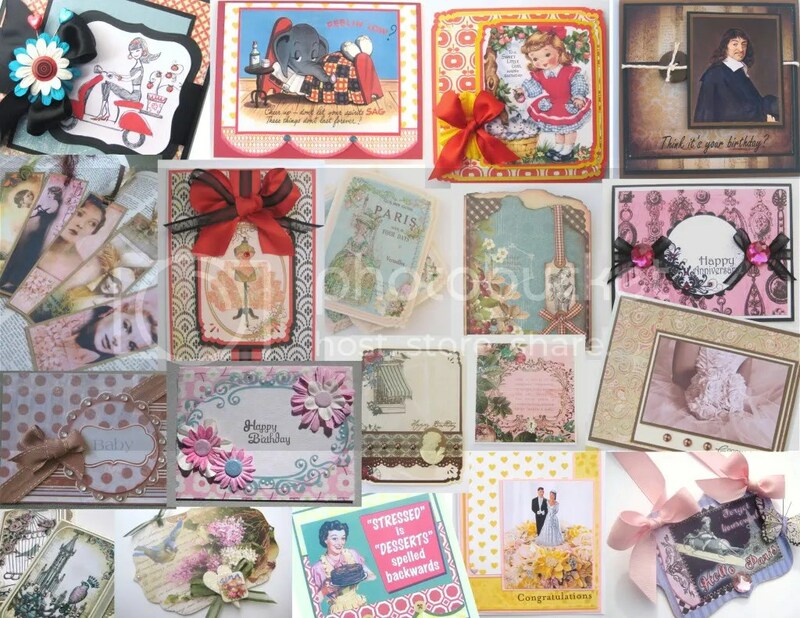 Paper crafting is a way for me to enjoy ephemera in a whole new way – by taking the illustrations I love and making one-of-a-kind collage art from them. Below are some of my recent creations. 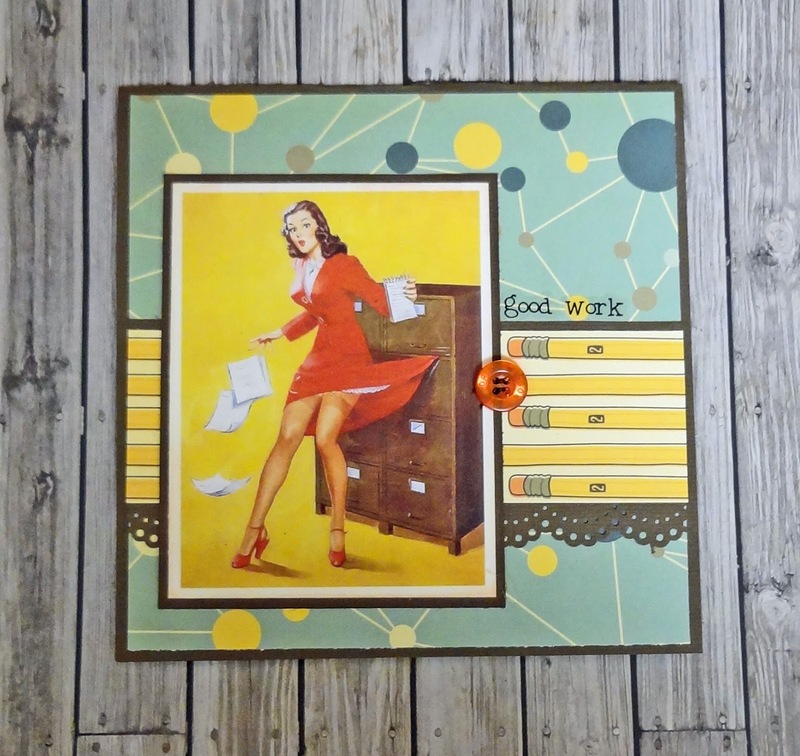 I have also included a free “Pressed for Time” pin-up image, which is a one-of-a-kind collage I made myself. Enjoy! Like that last card? Here is the image I made using Photoshop. Feel free to save it and incorporate it in your own crafts. Be sure to check out my Etsy shop for lots more goodies. Thanks for supporting handmade! My friend Callie and I share a passion for pin-ups! 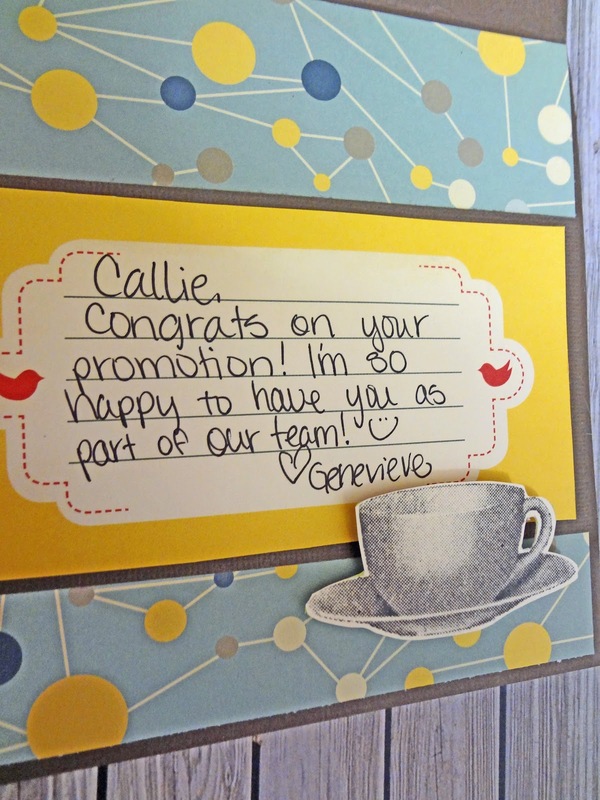 When she was recently promoted to Catering Manager in my sales office, I wanted to make her an extra-special card to welcome her. 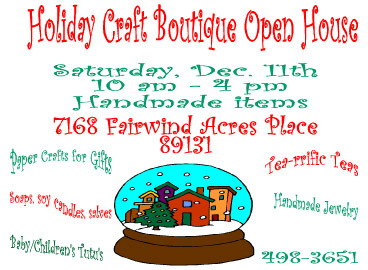 Join me this Saturday for an open house craft fair! I’ll be selling cards and handmade paper crafts, and you’ll also find everything from teas to tutu’s! Each seller will bring baked goods, too, so come hungry! 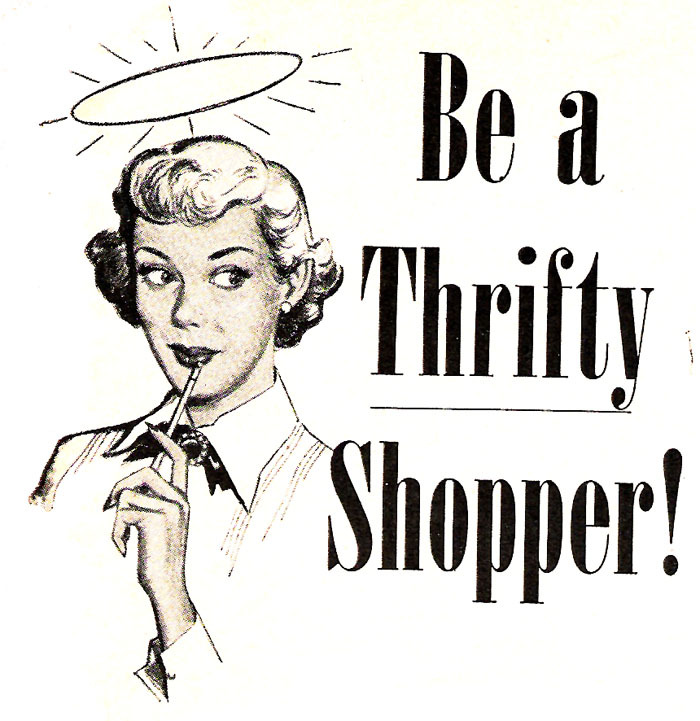 Special FREE SHIPPING Destash Sale This Week! FREE SHIPPING (U.S. and Canada!) on all orders over $10!! Thanks so much, and happy shopping!